The greatest collection of home arcade games ever amassed! The huge collection of Arcade Legends games plus all 29 award winning Golden Tee Fore! plus Atari arcade games! Complete courses, all in one arcade game cabinet. 130 games in total! Arcade Legends 3 is a full-sized video home game cabinet built with authentic hardware and materials used on commercial arcade cabinets. You are able to preview a game and view a short tutorial once you have selected and highlighted your choice game. The custom menu sorts the video game titles by name, manufacturer, or by favorites. Navigate with real arcade controls - (1) trackball, (2) joysticks, and (15) buttons. Choose between 130 game room games. By combining the Arcade Legends games and Golden Tee Fore! courses you have the greatest collection of home game room choices ever. 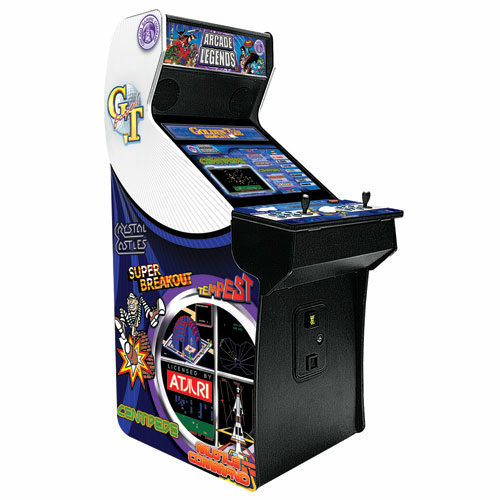 The Arcade Legends 3 is for home use only as the coin door is non-functional.